With the Guardians of the Galaxy movie officially in production it is time to start discussing the obvious, Rocket Raccoon. Is Marvel/Disney financing a massive budget for a movie about an action hero who is actually a Raccoon that can talk and shoot guns,.....YES. This is not easy to process the character definitely looks and feels very cartoony. What also may surprise people is that in truth, Rocket Raccoon will be the main star of the movie. Sure, the listed main character will be Peter Quill ie Star Lord because he is the only human in the bunch of intergalactic misfits and he helps give the group an earth connection. Rocket Raccon just takes over though. Where Rocket Raccoon goes he conquers. 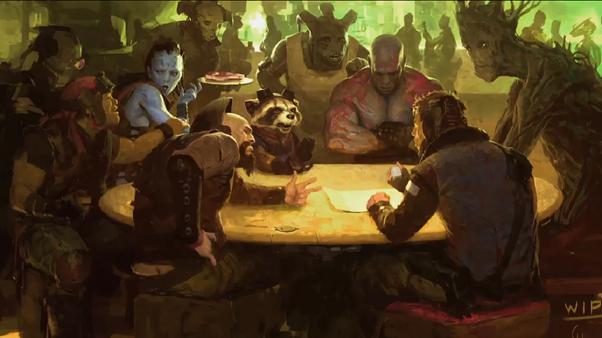 Don't believe me, look at the pictures below, and try not looking at the Rocket Raccoon. Nope you can't look away from the raccoon. He is too freaking awesome and outlandish at the same time. It is a clash of a cute against all of these otherwise rough looking characters. It causes him to stick out. The Mandarin is the Clairvoyant? Does the new Marvel Short reveal Luke Cage?